Our baby is the size of an orange! This orange seems a little big but it was all I had. This week I got very sick. I had about 4 days of feeling plain awful. But it was probably the first time that I felt like a mother. I remember throwing up (sorry tmi) and thinking I don't care if I am sick I just don't want my baby to be hurt. I've never had to think about my baby in that way. It was like a switch turned on. So despite the ickiness, I felt closer to baby this week, which was special. I haven't felt it enough to confirm but I am thinking in the next few weeks I will know for sure. Ah, I can't wait to feel my baby more often. 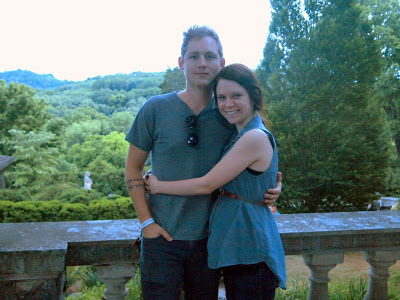 Michael and I joined his parents at Cheekwood last week. We saw the Bruce Munro's "Light" exhibit. It was so beautiful! There were lights set up in all the gardens. The one in the Japanese garden was my favorite. It was like thousands of sparkly fairies in the bamboo. The most impressive light exhibit was the one below. 20,000 lights across the grounds of Cheekwood. That was pretty magical too. That was the perfect way to end my week of being sick. One week closer to meeting our little one and now starting month 5!